I remember growing up while at summer camp whenever it stormed the camp director insisted all lights out, televisions off and there be minimal conversation between us. My mother's storm warnings have always been never talk on the telephone and refrain from taking baths. I have to say I really didn't believe there was danger in any of them since we were inside. I now know they both were for the most point correct. Not too sure about the one where we couldn't talk with one another. 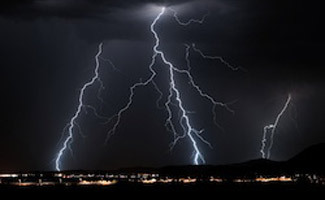 According to The National Oceanic Atmospheric Administration (NOAA) "over the last 20 years, the United States averaged 51 annual lightening strike fatalities placing it in the second position, just behind floods for deadly weather. In the US, between 9% and 10% of those struck die". You can read more on the yearly lightening strike statistics at Struck By Lightening an advocacy non-profit started by a lightening strike survivor website. In order to remain safe during thunderstorms it is important to know how to prepare and what to do during and immediately after them. Take time to read Thunderstorm Safety to help keep you and your loved ones safety during the storm.